The power to overcome...where do we get it? 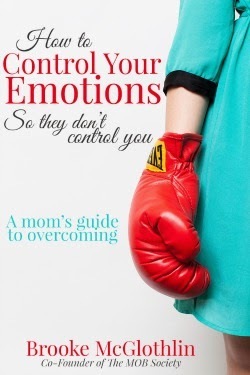 Chapter 3 of How to Control Your Emotions So They Don't Control You (a mom's guide to overcoming) is one of my favorite chapters because it reminds us of the power we have as children of God - the same power that raised Jesus from the dead! That excites me and gives me hope! Brooke does an amazing job of explaining this power of heaven to her son in a way that he can understand. She shares a conversation she had with her son after the grocery store car buggy incident with us in Chapter 3 "Where Do We Get the Power to Overcome?". I am so thankful for Brooke's example here in the words she chose to share with us in this book. It's something I'd never thought to do with my own son until I read this chapter; and not only with my son, I'm remembering this power for myself when my emotions seek to overcome me in my reactions. In all of my relationships - with my son, my daughter, my husband, my friends and family - I have to remember it is so important to stop when I feel my emotions rising to an unhealthy point and think about all that Jesus did so that I could have the choice to choose well in how I respond. I am so thankful for the Holy Spirit who comes to live inside of us when we become Christians! It is the Holy Spirit who changes us from the inside out. It is the Holy Spirit who empowers us to choose well in responding to those triggers that would seek to spin our emotions out of control. We have to recognize who we are as children of God! I can't help but think of a line from The Lion King when Mufasa tells Simba, "Remember who you are!" In those heated moments of life, we have to remember who we are in Christ. "If the Spirit of Him who raised Jesus from the dead dwells in you, he who raised Christ Jesus from the dead will also give life to your mortal bodies through His Spirit who dwells in you." This chapter has taught me I need to pause in the heat of the moment, take my eyes off of the circumstances and put them on Jesus, who will come to my aid the moment I ask. Brooke's prayer on page 19 did just that. Her day wasn't necessarily perfect afterwards, BUT her heart was changed which enabled her to approach her boys differently. God will do the same for us! I love how Brooke ends this chapter by giving us some pointers as we are starting out. I want to list them here briefly. More detail for each point is given in her book, which if you haven't gotten yet, I highly recommend that you do! You can get it here for only $3.99! This is a book I will be going to over and over again to remind me of the power to overcome that is mine as a daughter of the King! Ask your family, friends, and loved ones to keep you accountable. Well, friends, now it's your turn to share! Please link-up your blog post or leave your thoughts in the comments section. I'll see you here again on Monday as we prepare for Chapter 4. I can't believe our time together is almost over! I pray God is touching your heart through this book study. Have a blessed weekend!